Lake McDonald Lodge closed for the season on Friday, not quite a week after all guests and employees were evacuated because of a lightning fire ignited directly across the lake. It marks the second consecutive year the historic lodge has closed a month-plus early because of a wildfire. 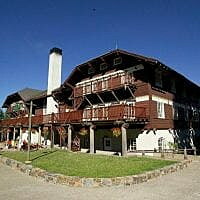 Last Aug. 30, the Lake McDonald Lodge closed for the season because of a dangerously thick blanket of smoke created by the Sprague fire, which ultimately destroyed the backcountry Sperry Chalet. Also closed Friday was Motel Lake McDonald, a small privately owned property. Guided horseback rides and the DeSmet tour boat that operated out of the lodge also were suspended until further notice. Already in effect was the closure of Going-to-the-Sun Road from Apgar to Logan Pass, and the evacuation of all properties on North Lake McDonald Road and the Avalanche and Sprague campgrounds. 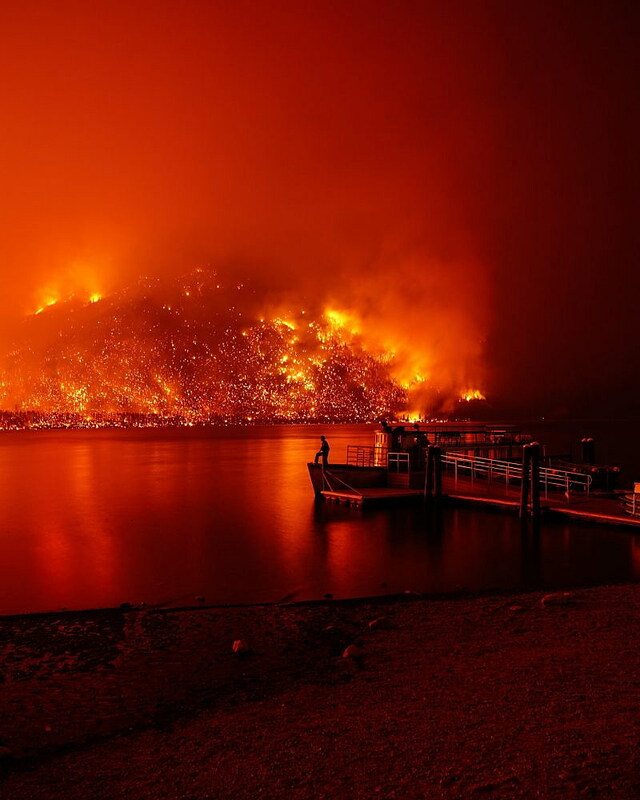 Glacier National Park Lodges, the concessionaire that operates Lake McDonald Lodge, made the announcement as a Type 1 incident management team took responsibility for fighting the 3,500-acre Howe Ridge fire. 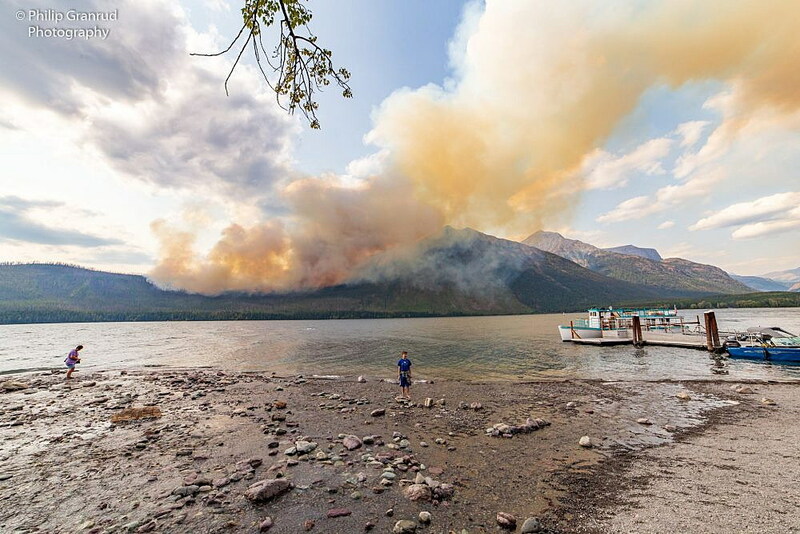 Ignited during a lightning storm last Saturday, Howe Ridge made a spectacular run late Sunday afternoon and night, burning more than a dozen historic buildings – public and private – on Lake McDonald’s west and north shores. By Monday morning, the 20-acre fire had covered 2,500 acres. It has burned aggressively since. On Friday, a report from incident commander John Pierson’s Southwest Area No. 2 team said expect the fire to grow along its northwest edge, toward Rogers Lake, and south to Lake McDonald. Flames are not expected to grow to the north because the fire has run into an avalanche chute and an area of sparse fuels, though winds could cause individual trees to torch. Pierson’s crews spent Friday working to protect the remaining buildings along North Lake McDonald Road, using sprinkler systems. They also began proactive planning for the protection of other areas that the fire could eventually reach. The incident management team is overseeing four wildfires in the area: Howe Ridge, Coal Ridge, Paola Ridge and Whale Butte. They will meet with interested community members and discuss their management plans at 6 p.m. Saturday in the Columbia Falls High School little theater. Pierson’s Type 1 team issued an evacuation warning on Friday to landowners and visitors in all Glacier Park areas north of the Bowman Lake Road junction with the Inside North Fork Road. That warning came because the Whale Butte fire, burning on the Flathead National Forest, is adjacent to the national park boundary. The warning means people in the area need to be prepared to leave at a moment’s notice, should fire conditions become severe. Glacier Park will not issue any new overnight permits for backpackers entering or exiting from the Kintla trailhead. However, day use trails and the Kintla Lake campground are still open and accessible. The park reminded visitors that Stage 2 fire restrictions remain in effect. Travelers who had reservations at Lake McDonald Lodge should call 855-733-4522 about adjustments to their stay. Those who had planned to stay at Motel Lake McDonald should contact 1-844868-7474 for adjustments. Commercial visitor services in most areas of Glacier National Park remain open, including Apgar Village, Two Medicine, St. Mary, and Many Glacier. A fire information line is available at 406-888-7077 for those with additional questions.